Mighty Axe is Minnesota’s largest hop farm growing the best of MN terroir to brewers and drinkers across the country. They farm 80 acres of hops and operate an on-farm harvesting, drying, and pelleting facility. Pluck Flower Farm is a small scale cut flower farm growing courageous blooms with care. Pluck's flowers are grown in coordination with nature, seasonally and without chemicals. 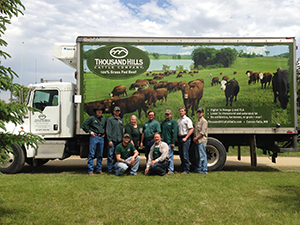 Thousand Hills raises 100% Grass Fed Beef focusing on nourishing soil, plants, cattle and people by holistically grazing cattle for their lifetime.